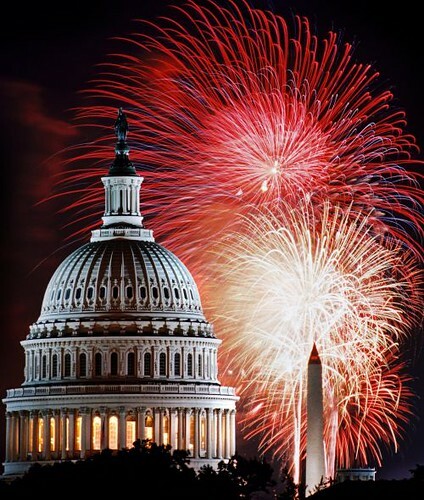 It's almost time for the fireworks, backyard barbecues, vacations, and all the rest that comes with the extended Fourth of July weekend in celebration of our nation's independence. I am proud to be an American and appreciate all the freedoms and opportunities that this nation affords me as a citizen. While a lot has been said over the past few years about this great country I call "home," there's no denying the United States is and will always be the greatest socio-political experiment in the history of the world. God bless America now and forevermore! Before you get caught up in all the busy activities of the holiday, I wanted to share a few low-carb headlines with you that have been in the news lately. It simply amazes me how a way of eating that has been so incredibly maligned and dragged through the mud like livin' la vida low-carb can somehow still be talked about so much in the media. Albeit it's not always in a positive light, but they can't help bringing it up. Maybe deep down inside they realize there is more to low-carb than they're letting on. People always ask me if low-carb living is healthy for children. Why wouldn't it be? Our bodies were never meant to handle high amounts of carbohydrates, so it stands to reason that eating a low-carb diet is gonna be healthier for kids. And now we have this study published in Asia Pacific Journal of Clinical Nutrition from a researcher down in Australia I've blogged about before named Dr. Manny Noakes. She found that an unlimited low-carb, high-carb diet produces more weight loss than higher carb diets with limited calories, primarily because the protein seems to increase satiety. Additionally, these obese elementary school study participants placed on a low-carb diet experienced a significant drop in their total cholesterol and triglycerides. WOO HOO! From the Department of Well Duh!, the results of a 12-week low-carb program for Type 2 diabetics found that they were continuing to improve their health and weight one year later. The program is called "Why WAIT" and was shared at the recent 68th Annual Scientific Sessions of the American Diabetes Association. Lead researcher Dr. Osama Hamdy followed 85 people with type 2 diabetes for an average of 10 years. The plan included regular exercise as part of the initial 12-week plan. Although there were obvious improvements at the end of the intervention period of the study, the remarkable thing is that the study participants CONTINUED to lose weight on their own. However, their A1C levels did increase, but blood pressure was stabilized and HDL cholesterol was "significantly higher" at the end of one year. And, one shocking finding in light of all the negativity about low-carb diets, the study participants saw an IMPROVEMENT in their kidney function with a slight decline in protein in the urine. For the purposes of this study, carbohydrate restriction was defined as 40 percent of the calories from carbs which is closer to The Zone level of carbs than the Atkins diet. It does make you wonder how much BETTER the weight loss, A1C levels, cholesterol, and other health markers would be if a truly low-carb ketogenic diet would be used on these patients. Dr. Hamdy says the reason patients regain weight is because they don't eat enough protein or cut back on exercise which results in the accumulation of belly fat. Interestingly, the financial impact of diabetics losing weight, according to this study, is huge--a 65 percent DECREASE in medical expenses coming out to a cool $560 annually. And let's not forget how good healthy feels! You can't put a price on that! WHAT IF WE JUST GOT RID OF ALL THE FAT PEOPLE? Don't be alarmed at the question in that headline above, but it's basically what this column from MSNBC recently wanted to know. They analyzed the financial burden that overweight and obese people have on our society in a rather uncaring and some would say demeaning way. That's why I appreciated one of my readers sharing this blog post from Chet Day with a very impassioned response to such an insensitive post. While I don't subscribe to the fat acceptance movement that tells overweight and obese people to just be happy with their large bodies, I don't think threatening to wanna wipe out fat people is the right way to motivate them to make the changes necessary to improve their weight and health. But it is a sensitive subject that warrants a little more class and a lot less crass. I was listening to the radio the other day and a commercial for a colon cleanse product asked the question, "Are you eating too much red meat..." I didn't even hear much of the rest of the ad because that turned me off so much. This idea that high-fat meat consumption is somehow harmful to your health is so teetering on insanity that we should get straight jackets ready for anyone who chooses to declare something as absurd as that. But leave it to our buddies at Newsweek to jump right off the cliff with a column a couple of weeks ago entitled "Your Lifestyle, Your Genes and Cancer." They assert in this article that if people would simply live a "healthier lifestyle" (which isn't exactly what you and I might consider healthy), then 70 percent of all cancers would cease to exist. Okay, now that's a pretty bold statement, especially in light of the specific kind of changes they expect people to make--get thinner (easier said than done! ), exercise regularly (is that cardio or resistance training? ), avoid diets rich in red meat (why would I do that when this is the basis of a healthy low-carb lifestyle? ), eat diets rich in fruits and vegetables (I already do being selective about choosing low-sugar fruits and non-starchy veggies), and stop using tobacco (you don't need to smoke--EVER!). We learned from my podcast interview with Doug Kaufmann earlier this year that fungus is at the root cause of most cancers and the best way to reduce the existence of fungus is to eat a low-carb diet. In fact, Newsweek competitor Time magazine last September featured a column about German researchers using a very high-fat, low-carb ketogenic diet with GREAT success on cancer patients who have been told there was no hope for them. While it may be en vogue to continue repeating that red meat and saturated fat is harmful and leads cancer, the truth doesn't bear that out. These people won't be able to get away with such bombastic statements for very much longer without being sent to the funny farm! You gotta love it! Mike Benoit competed recently in the Newfoundland and Labrador Amateur Bodybuilding Association Championships as a 37-year old man and placed first in the Light Heavyweight Division (176-198 lbs), first in the Masters Class (35 years and up), winning the Top Poser Award and capturing the overall title of Mr. Newfoundland and Labrador as the best of the best in this competition. He was the oldest person EVER to be given that distinction and he credits his win to something that should put a big smile on your face. "I was the only one at the show that did fat burning; every other competitor there avoided fats to get lean where I consumed mostly fats, essential oils and protein...So I did a modified fat diet for the show and at 37-years-old, I was the leanest one there with doing the least amount of cardio. Many people have heard of the Atkins diet, well I basically did a modified Atkins diet." Holy cow, isn't that amazing?! Mike consumed dietary fat to burn fat, was thinner than anyone else in the competition, did little to no cardio at all, and was livin' la vida low-carb. Can you say WOW?! I'd love to interview this guy and have him share some of his training techniques with us because I'm sure it will turn everything we think we know about fitness training on its head. The unbelievable part of this story is the fact that this was the first competition he participated in since the late 1990s. AMAZING!!! Kudo Mike Benoit and if you're reading this, contact me about that podcast interview at livinlowcarbman@charter.net. WHO IS THE ADA KIDDING WITH THEIR SMOOTHIE RECIPE? Did anyone else catch a MAJOR problem with those numbers? Aside from the fact that a diabetic has NO business at all eating a very high-sugar food like a banana, check out the dietary fiber content of this recipe--the ADA claims it has 31 grams. HUH?! If the total carbohydrates include all sugars and dietary fiber, then those two numbers should add up...but they don't! If you add 31g (dietary fiber) plus 23g (sugars), then your total carbs are ACTUALLY 54g per serving. And this recipe makes 2 servings, so ostensibly a diabetic could see this as a "healthy" recipe and consume both servings for a grand total of 108g total carbohydrate if indeed those numbers are accurate. Everybody's favorite health and nutrition expert Dr. Jonny Bowden, author of Living The Low-Carb Life and 150 Healthiest Foods On Earth, was featured this week in the New York Times in a story entitled "The 11 Best Foods You Aren't Eating." Jonny is quoted promoting these 11 foods that are PERFECT for your healthy low-carb lifestyle because of their powerhouse nutritional content, including cinnamon, sardines, and frozen blueberries. Don't forget you can meet Jonny in person on The 2nd Annual Low-Carb Cruise coming up in January 2009 and hear him speak about the subject of weight loss and health. He'll also be a special guest on my podcast show again coming up soon to talk about his other projects, including his latest recipe book called Healthiest Meals On Earth as well as his brand new Diet Boot Camp that's been 13 years in the making. I recently shared in this blog post that my total cholesterol is 326 which includes an LDL cholesterol reading of 246. While this may shock a lot of people who still buy into the traditional cholesterol hypothesis (that number is diminishing more and more each day! ), the fact of the matter is I am healthier with these numbers than someone like the late Tim Russert was at the time of his unexpected death. Why? This well-written article by Dr. Paul E. Lemanski, MD explains all about how LDL particle size is what is most important in assessing heart health. The most interesting part of this two-page paper was when Dr. Lemanski noted that "individuals with triglycerides below 70 do not have small, dense LDL," the kind that are especially dangerous to cardiovascular health risk. These people have the large "fluffy" kind of protective LDL particle size that you want. Only those with triglycerides above 100 and HDL below 50 need to be concerned about having their LDL particle size measured. We need more doctors who are willing to talk about particle size rather than the total or LDL cholesterol number if we are ever gonna actually help people get healthier. Dr. Lemanski noted that statin drugs, like Lipitor and Crestor, "do not change particle size appreciably." So it doesn't really do any good going on these drugs when you can remedy particle size problems through changes to a low-carb diet. Additionally, triglyceride therapies are needed when those exceed 150, but once again a low-carb nutritional approach can bring those numbers down below 100. Low triglyceride levels (below 100) and high HDL numbers (above 50) are two of the most effective ways to improve your cardiovascular health and both can be accomplished by livin' la vida low-carb. Why wouldn't you do that instead of taking a bunch of pills? One of the most popular diet programs in the world today is Weight Watchers. How in the world did they become so successful? They tapped into the community aspect of weight loss by bringing overweight people together in one place to share in their experiences as a group and to provide each other with the support they need to be the success they want to be. It's a good concept on paper. But it doesn't work for everybody. A reader previously shared about how Weight Watcher publicly shamed her because SHE failed to lose weight on the low-fat, low-calorie diet advice they were pushing at her. It's no wonder how low-carb is so perfect for those who failed on Weight Watchers and why hearing the stories of low-carb success is so captivating for people who have been through the traditional Weight Watchers program. And the people at Weight Watchers have been taking notice of this. That's why they created their program called "Weight Watchers Core." While this is indeed a low-carb option for people on Weight Watcher who need to be mindful of their carbohydrate intake, you can't help but notice all the low-fat crap they say you have to eat, too, that I wouldn't touch with a ten-foot pole: fat-free milk, fat-free cheese, fat-free sour cream, soy milk and cheese, whole-wheat pasta, brown rice, potatoes, and grains, cornmeal, rolled oats, puffed wheat, puffed rice, shredded wheat, and 100% bran cereals, "lean" meats, tofu, vegetarian burgers, fat-free salad dressings, fat-free margarine, fat-free mayonnaise, and popcorn--AAAAAACK! Make it stop! Make it stop! If you wanna start livin' la vida low-carb, then just read Dr. Atkins' New Diet Revolution or Protein Power and do it! Keep attending your meetings if you are locked into an obligation to be there and show off your amazing weight loss totals. When they ask you how you do it, be sure to proudly say that you are consuming a healthy high-fat, low-carb diet. If the leaders keel over at that point in utter shock, then I think you will have made your point beautifully! In early 2007, I shared with you about a new documentary film from an independent filmmaker named CJ Hunt called In Search Of The Perfect Human Diet. Hunt interviews all sorts of people in the world of diet and health including many low-carb researchers and activists you may know including Dr. Mike Eades, Dr. Barry Sears, Dr. Abby Bloch from the Atkins Foundation, Dr. Jay Wortman, Dr. Steve Phinney, Mrs. Veronica Atkins, Dr. Mary C. Vernon, Dr. Eric Westman, and MANY MANY more! It's quite a lineup and this film is now in post-production. But the GOOD NEWS is CJ Hunt has received this letter of official interest from San Francisco's PBS station group led by KQED and they would like to share it with the 353 other stations in the PBS system to have them air this nationwide on PBS. How amazing would that be? CJ is hopeful this will be just what the film needs to secure the much-needed sponsorship and donations for the remaining completion funds. Feel free to share this letter from PBS with any potential sponsors who you think might be interested in attaching their name to such a project. We saw what happened in Canada earlier this year when they aired a low-carb diet documentary on CBC-TV featuring low-carb researcher Dr. Jay Wortman and filmmaker Mary Bissell entitled My Big Fat Diet. The same experience could happen for In Search Of The Perfect Human Diet in the United States. I'll let you know if PBS seals the deal on airing this film. What an amazing opportunity! THE TOP 10 CARBOHYDRATES FOR A "HEALTHY" DIET? I know I shouldn't do this to myself, but I subscribe to a wide variety of diet and health publications online that offer varying viewpoints about what is considered healthy. Reading some of this stuff helps me solidify in my mind exactly what I believe and why I believe it. This article from ShapeFit extolling the virtues of consuming carbohydrates for weight loss was just a little too much for me, though. This line alone was enough to make me nearly blow a gasket: "To lose body fat, you want to shoot for 150 g carbs/day, 150 g protein/day, and 75 g fat/day if you were the above person!" They were referring to a 200-pound individual with 25 percent body fat. I wonder how many carbs they'd recommend for a 350-pound man with 45 percent body fat?! Would they dare say 300 g carbs/day?! Sheeeeez!!! Yes, you want to eat some carbohydrates for their phytonutrient profile and nutritional impact on your body. But giving people the impression that they should be consuming triple-digit carb counts is irresponsible no matter how virtuous you make the carbs sound. Limiting your carb intake to double digits will make you healthier, more fit, and live longer than you ever would consuming a consistently triple-digit daily carbohydrate diet. There's no debating that based on all we know about carbs. In the UK, one of the leading voices on behalf of livin' la vida low-carb is Dr. John Briffa. It shouldn't come as a shock to anyone that he is under constant attack from the medical and health establishment in that country for his positions in support of the low-carb diet for diabetics and the obese. In fact, one prominent health blog called NHS Blog Doctor has been relentlessly railing against Dr. Briffa over the past month in posts here, here, here, here, here, and here, just to name a few (I think this Dr. John Crippen must have some sort of man-crush on Dr. Briffa as much as he's writing about him!). Despite these personal assaults against him, Dr. Briffa is still able to be an influential voice of reason in the health media in the UK as evidenced by this Business Day column highlighting the findings of the large-scale Action in Diabetes and Vascular Disease study that found intensive treatment to lower blood sugar levels is a safe, effective way to reduce the serious complications of diabetes. This was the PERFECT response to the ridiculous ACCORD study funded by the National Institutes of Health (NIH) that warned diabetics AGAINST testing their blood sugars or else risk an increase in mortality rates. Dr. Briffa breathed some sanity back into this discussion by stating the traditional diabetic diet of high-carb, low-fat "disruptive" foods just doesn't work to control blood sugars for diabetics. He adds that eating a diet low in carbohydrates and higher in vegetables and dietary fat will result in better control of this disease quite possibly without the need for medications. YES!!! THANK YOU Dr. Briffa for articulating what needs to be said. I will be interviewing Dr. Briffa for my podcast show in the future when things settle down for him a bit. He's one of the most knowledgeable and articulate defenders of the healthy low-carb lifestyle across the pond and I'm grateful for the work he is doing there to help the British people suffering from weight and health ailments. Just two years ago I reported in this blog post that the number of Americans with diabetes or pre-diabetes totaled 73 million. But in just two years, that number has already jumped to 81 million, including a 5 million American increase in diagnosed cases of all types of diabetes, according to this CNN story. Dr. Ann Albright from the Centers for Disease Control was lauding the fact that there was a 5 percent drop in the number of people who had diabetes and were unaware of it--dipping down to 25 percent from 30 percent. But in today's information-oriented society, there's no reason why people can't tell if they are dealing with blood sugar issues or not. Blood glucose monitors are readily available and diabetes care is quickly becoming a common health condition (although the way many doctors are treating it is out of whack!). Expect those numbers to continue to rise unless groups like the ADA takes their recommendation of livin' la vida low-carb to the next level. Expect that to happen within the next few years as diabetes rates keep rising! AHA INTRODUCES THE "BETTER FAT SISTERS"
Do you remember those two stupid cartoon characters that the American Heart Association (AHA) created last year called Bad Fats Brothers? Sat and Trans (stands for saturated fat and trans fat) remind people of all the foods they are in and how much they'll "break your heart." Well, now the AHA has come out with a new set of characters Mon and Poly--aka the Better Fat Sisters. Get it? Mon for mono-unsaturated fat and Poly for polyunsaturated fat. Riiiiiiiight! These are supposedly the only healthy fats which is ridiculous since saturated fat isn't as bad for you as it has been made out to be by those brilliant minions at the AHA! And then to have Sally Squires from The Washington Post write this story about the Better Fat Sisters just puts this one over the top for me. When the American Diabetes Association showed their support for low-carb diets in January 2008 just for weight loss up to one year, you had to know there would be some naysayers who are strongly in support of livin' la vida low-carb who realize this way of eating is more about blood sugar control than weight loss. And now it has happened. This Diabetes Health column talks about a new study conducted by 24 doctors from around the world who say the ADA position of consuming a minimum of 130g carb daily is unreasonable for diabetics. This new "critical appraisal" of these recommendations is an effort to get the ADA and other diabetes health groups to rethink their position on low-fat, high-carb diets which usually lead to a pharmaceutical drug to handle the negative blood sugar/insulin response. YES! Here's hoping this leads to progress that will genuinely get the ADA to wake up to low-carb for diabetes control--and not just weight loss. When I read this Newsweek magazine article, I couldn't help but laugh out loud because she was talking about people like ME! Of course, I disagree with her conclusions about how people on a diet that restricts their choice of foods leads to a drag on a summer party. Come on, don't put that onus on those of us who are choosing to live healthy lifestyles. ENJOY a good laugh with this one. Unfortunately, you'll notice the recipe calls for fat-free cream cheese, confectioner's sugar (WHAT?!!! ), bran cereal crumbs for the crust (UGH! ), fat-free yogurt...OH MY! Make appropriate full-fat, sugar-free substitutions and this one has promise. I just can't believe they're pushing this HIGH-CARB cheesecake as a "low-carb" cheesecake. Come on, where is the journalistic integrity? Got a low-carb diet, health, or nutrition story to share with me? I'd love to hear it, so e-mail me the blog idea anytime to livinlowcarbman@charter.net. THANKS for reading and be sure to have a SUPER July 4th weekend! Heya, Jimmy. Interesting stuff! But I guess I have to step in and respectfully make an observation about your comments on the Weight Watchers core program. You talk about "the low-fat crap they say you have to eat," but, actually, it's low-fat crap they say you CAN eat if you want to--not that you HAVE TO eat it. The whole point is that you eat what you want to among the low carb greens and leans, and then you have about 1800 extra calories a week to use on your fats. I know WW is not your cup o'tea, but it does work for some folks and I hate to see misinformation spread about their program just as much as I hate to see misinformation about low-carb. Can't we all be friends?! Just my 2-cents! Fair enough, Suzique! I just couldn't believe all of those fat-free, low-fat options that you have to choose from. What's wrong with the full-fat versions? I guess that's the crux of my criticism. But I appreciate hearing your two-cents worth anytime, my friend. THANKS for reading! Hope your brother is doing okay. Interesting on the ADA label. Something is definitely wrong and hopefully its just a typo. Based on 1 gm of protein, 1 gm of fat (interesting there are only 5 fat calories on 1 gm) and 32 gms of carbs, it should be 145 cals and not 130. The problem has got to be with the fiber content. I have a hard time believing there are 31 grams of fiber in a cup of strawberries and half a banana. The one thing that bothers me regarding WW is their point system. How can any food have zero points? Weight Watchers has zero point foods for the same reason certain food labels list carb counts as 0 when in fact it does have carbs; they round. If a food is high enough in fiber, and low enough in calories and fat, the points value would be < 1, therefor 0 points. Now, if you eat enough of this 0 point food, it would actually add up to a point or more. Its more of a marketing gimmick than anything, promoting the idea that you can eat something and it doesn't count, when in fact it does. Its quite funny how Dr Crippen's readers see Diabetes UK as doing their best and Dr Briffa's readers believe Diabetes UK is giving out completely wrong advice. I'm with Dr Briffa. Perhaps the Doctor who writes the NHS Blog Doctor should read the UK version of Good Calories, Bad Calories. At least then, he'd be arguing from a position of knowledge vs ignorance. I avoid just about all whole grains, Lee, because my body is so sensitive to carbs that even oatmeal will be converted to sugar in me. Some people can get away with it, but I can't. THANKS for writing! LDL. It would not be necessary to measure LDL particle size in these individuals." I'd never seen it stated this explicitly before. That'll save me a few bucks on blood testing. Clearly, the dietary fiber listed is a typo or purposefully (and harmfully) misleading! Here, the ADA only listed the information for ONE SERVING (and as many of we diet veterans know, many people don't pay attention to serving sizes, as you pointed out, Jimmy). The information, with the exception of the dietary fiber, is only slightly variable from what FitDay popped out. I sincerely hope that the recipe is not in that cook book written that way! I came across your great summary here via a trackback to one of the articles on the NHS Blog Doctor site slating Dr Biffa. I am not a diabetic but I do feel strongly that the advice they are getting on diet is inconsistent and the the medical establishment in general is far too slow to embrace new ideas on diet in the face of overwhelming evidence, albeit anecdotal. The question is, how much anecdotal evidence does there have to be before it becomes irresponsible to ignore it? In case you are interested, I recently wrote a piece on my blog which asks whether the medical establishment is squandering an opportunity to make use of the internet's wealth of testimonies, using the case of diet and diabetes as the central example. Are we Underrating the Anecdotal?